The responsibility of helping people through change, or ‘change management’ tends to fall upon leaders, change managers, project managers or human resources. However, generally whatever little time there is to perform change management is usually spent delivering communications and maybe the occasional employee survey. Although these are good practices, they do not get to the heart of what makes change successful – the individual employee’s desire and actions. In my work with a wide range of large organizations and companies, I offer a practical training and certification course so meditators can become skilled mindfulness facilitators in their workplace. I also combine change management techniques with mindfulness to help people through difficult change. As a certified organizational change manager and mindfulness facilitator instructor, I see the pains that organizations go through and how attention to the individual can make a world of difference to their change journey. 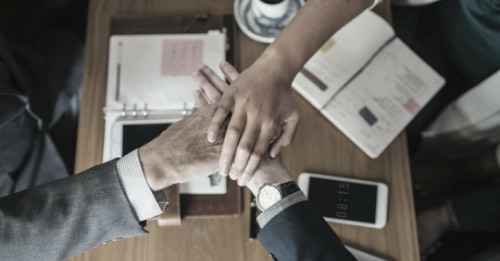 If you have taken any change management training, you likely have heard that “change happens one individual at a time.” The reality is that little attention is spent with individuals to see how they are feeling, what concerns they have and coaching them on how their behaviors affect the outcome of the change. Well, no wonder, because this obviously takes a great deal of time and skill to do this well. There is a lot of pressure on leaders to lead their staff through change, and they themselves are not often well-supported. Corporate change communications and employee surveys are great, but just scratch the surface. Why Combine Change Management with Mindfulness? Workplace mindfulness has many benefits. Stress management, clarity of thought, less conflict, better decisions, and the wonderful long list goes on. Change management helps move the organization and employees from a current state to a future state, so the expected benefits can hopefully be realized. Yet the individual is often overlooked. After all, if you don’t get people onside or at least able to move forward, your change is likely to fail and be riddled with problems and resistance. It guides an individual through their change journey in a conscious and private way. Being skillfully guided through the stages of an individual’s change journey opens the eyes of the listener in the privacy and safety of their own mind. Most people are not eager to openly discuss their reasons for being upset or indifferent about a change but they are usually curious to explore their world in private, alone. It increases an individual’s self-awareness of their emotions, reactions, and behaviors. Busy people tend to live in survival and auto-pilot mode, not taking quiet moments to self-reflect on how they are experiencing difficult change in their lives. Often they are anxious, frustrated, and bitter. They don’t realize how their emotions, reactions, and behaviors are affecting their own experience and even how others perceive them at work. Most “resisters” would not consider themselves a resister. It can help an individual decide how they would rather react to the change.There is great personal power in realizing that you have control over your own reactions. How am I reacting? Is this the way I want to be? Do I have any influence over the change? What experience would I rather have? I was the organizational change manager at Pacific Blue Cross while they underwent the largest transformation project in the organization’s history. It was a long, difficult, seven-year project that changed all systems, jobs, business processes and how they interacted with their clients. In 2011, when workplace mindfulness was not yet on any organization’s radar, I started up a weekly mindfulness meditation lunchtime practice for my co-workers. After having personally discovered the power of this practice while I went through my cancer experience, my co-workers asked me to teach them what I knew. It became a success story – 25% of the organization (183 people) were attending my weekly, 30 minute, drop-in meditation classes. The benefits people reported were amazing. I played with adding change management principles to my meditation program. I incorporated this into both the live guided meditations and in the quick mindfulness lectures before and after the meditations. Then, five months post-implementation, I surveyed the group. 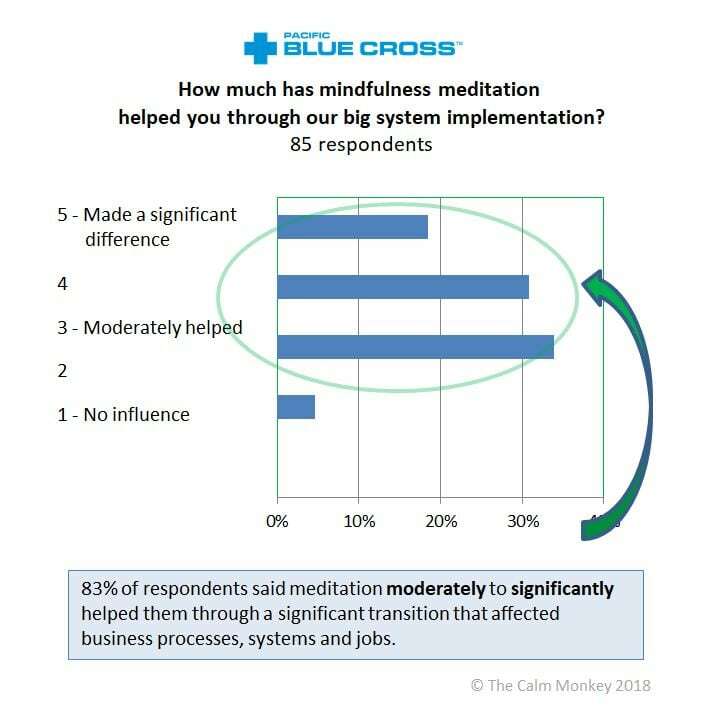 Surprisingly, I discovered that 83% of the respondents reported that the specialized mindfulness meditation I had tried on them moderately to significantly helped them through the massive change. Our executives deemed the project as a change management success because although we endured fairly significant technological and business process pains from the project, the staff remained calm, problem-solving-focused and committed to making things better. 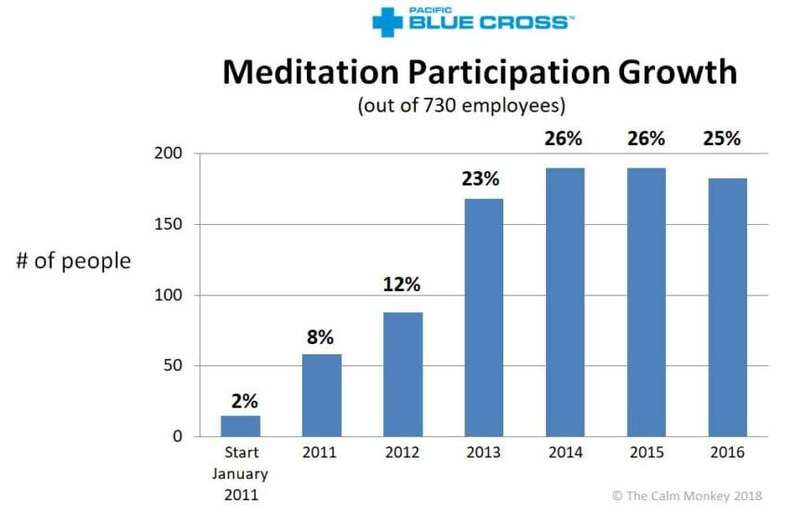 Mindfulness meditation was seen as a key contributor to this change management success story. RESOURCE: White Paper: ‘Meditation – a Powerful Change Management Tool’. This case study is documented in this award-winning global Association of Change Management Professionals (ACMP) white paper. I invite you to have a look at this paper as it has received much attention by the ACMP, HR associations, and change management and business organizations. Many people remark that they are able to get support to start mindfulness at work by referencing this white paper, so perhaps it will help you as well. After experiencing the case study at Pacific Blue Cross, I sought to further explore this idea of helping people through change using mindfulness. Integrating change management techniques with mindfulness meditation helps people through difficult changes. The study method used asked participants to listen to my specialized 15-minute meditation recording at least three times in a two-week period. They were to think about a difficult change they were experiencing, track their progress, and report their results after the two weeks. 83 participants completed the study and gave very detailed and insightful feedback. 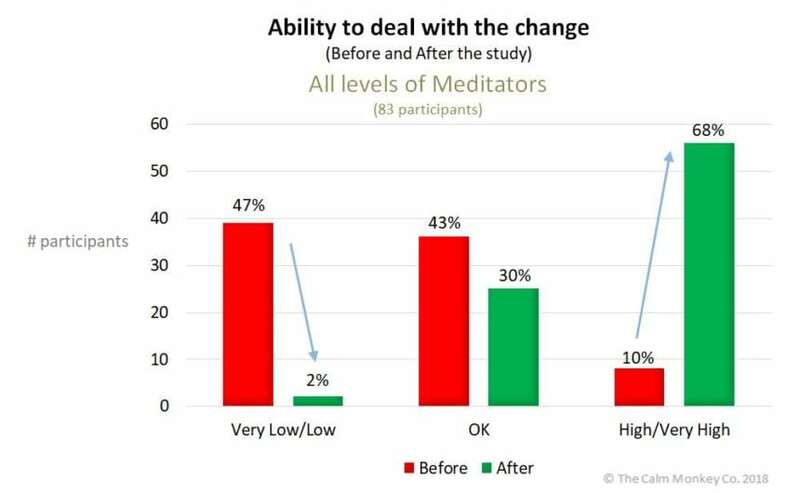 All participants, from non-meditators to experienced meditators, showed positive results. As seen in the chart below, only 10% rated their ability to deal with the change as High/Very High before the study. This number dramatically increased to 68% after the study. It helped equally for work and personal changes. 72%-89% reported increases in awareness of emotions and behaviors, better ability to manage themselves, calmness, positive feelings, and feeling in control. The participants’ comments strongly indicated this helped them in several aspects of dealing with the change and made them more resilient. There was interest in obtaining this meditation to help their friends and co-workers. Combining individual change techniques with mindfulness meditation produces measurable and very positive results. It helps people through difficult change,regardless if they have prior meditation experience or not. The study also revealed many more benefits, as seen in this chart below. 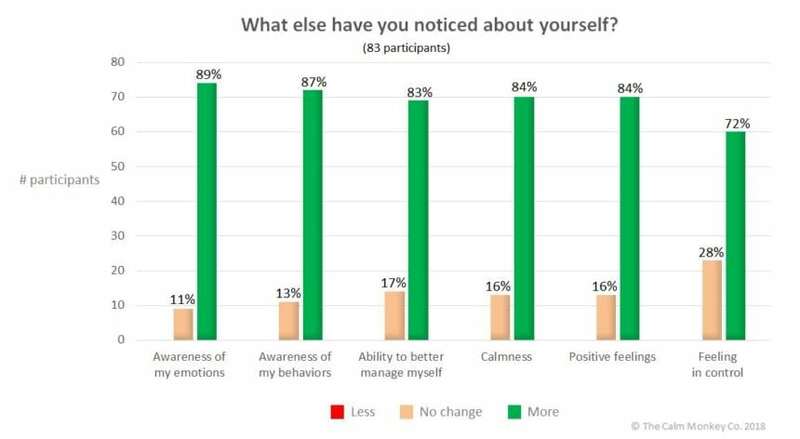 Participants reported being more aware of their emotions and behaviors, having a higher ability to manage themselves through their change, increased calmness, positive feelings, and feeling in control. Our department is being totally re-organized. Adjusting to a new boss. I lost my largest client. New to my leadership role. Relationship issues with my spouse and wanting to change how I deal with it. Aging parents’ declining health and its impact. Huge life decision to retire and having a hard time adjusting. Setting goal to live healthier. RESOURCE: Research Paper: ‘Dealing with Change Mindfulness Meditation Study’. The complete results of this study are documented in this research paper, showing more data and comments provided by the participants. What Does this Change Management Meditation Do? The meditation contains a number of techniques. Here are a few: It gently, yet powerfully, guides the listener through consciously raising their self-awareness of their reactions, emotions, and behaviors pertaining to their chosen difficult change. Then, it guides them through identifying how they would rather react to the change and sets positive intentions. It also explains that although we don’t always have control over a change, we always have control over how we choose to react to a change, so choose your reaction. It invites them to reframe negative views to positive views, and asks them to identify what they will learn from this change. All these techniques are very empowering. Given the compelling results of Pacific Blue Cross case study and the Dealing with Change study, it was clear to me that people can really benefit from this technique. Now that mindfulness is a popular and growing practice, especially in the workplace, it’s a small stretch to add change management techniques into the practice. Using the generous input provided by the study participants, I am developing a Dealing with Change Toolkit that organizations can give to their staff as a resource to help them through change. If you want to truly help people through change at work but don’t have the resources to spend at the individual level, consider combining change management techniques with mindfulness practices. Done authentically, your employees can find great relief from constant change and actually create a better experience in their challenging world of work. Wendy Quan, founder of The Calm Monkey, is an industry leader, training and certifying mindfulness meditation facilitators in the workplace and combining change management techniques with mindfulness to create personal and organizational change resiliency. Wendy has an extensive corporate background in Human Resources, IT, change management and mindfulness. She is a thought leader speaking at conferences and summits worldwide. She continually innovates to live her mission of Creating a Mindful World, Together.